Now that the fridge is packed with Thanksgiving leftovers and the radio is broadcasting hourly traffic reports for mall parking lots, it’s time to start thinking about the pending holiday season and the big H.C. That’s right: Holiday Cards. Why not let this be the year you don’t wait until the last minute to send out your season’s greetings? In fact, if you have a library full of photos from the year, now’s a great time to take advantage of them—not just for holiday cards, but also for custom calendars, books, and more. There’s plenty of online companies that will take your photos and turn them into holiday greetings. But if you use iPhoto, you already have everything you need to create custom cards, calendars, and books. And using iPhoto saves you the work of having to upload your image to someone else’s server and then design your creations in a Web browser. Plus, you can take advantage of special features like maps, custom fonts, and flexible templates. Here are some of our favorite tips for designing beautiful iPhoto projects. You’ll generally get the best results from photos that have vivid colors and plenty of contrast. If you use a photo with soft, muted tones (for example, a foggy lake at dawn) you may see subtle vertical stripes, or striations, in the printed result. These tend to be most noticeable in calendars or full-page photos. Because of the process used to print books, calendars, and cards, most images benefit from a bit of additional adjustment. iPhoto lets you optimize a photo for a particular project without having to change the original version in your photo library. That means you can bump up the sharpness or turn an image into a black-and-white photo without affecting how the image looks in other albums or slideshows. To make localized edits, select a photo on one of your template pages, and then click the Adjust button. Lighten Shadows Printed iPhoto projects suffer from dot gain, a darkening of images caused by the paper absorbing ink. So it’s a good idea to err on the side of lighter images. If you have a very dark image, open the Adjust panel and bump up the Shadows or Exposure sliders a bit. Obviously, you don’t want a washed-out image, but if your picture has lots of dark, shadowy detail, a little adjustment can help ensure that you don’t lose it. Sharpen The printing process used for iPhoto printing doesn’t yield tremendously fine detail. Individual hairs and delicate textures can sometimes get lost. So it’s a good idea to apply some slightly aggressive sharpening to your project’s images. This will give you better detail, and it will help to improve the contrast in your final image. Too much sharpness can be a bad thing, though. Don’t push the sharpening to the point where you see noticeable halos around the fine details in your image. Don't crop photos beforehand. Instead use the zoom slider and hand tool when designing your project. Crop Likewise, you don't need to crop your photos before you start laying out your project. To crop a photo that you’ve added to a card, book, or calendar, place it on the page, click on it once, and then use the slider that appears above the photo to zoom in.Click the hand icon to reposition it within the frame. This will leave your original images untouched. If you’re documenting a road trip in your photobook and using iPhoto ’09, why not include a map that highlights where you’ve been? Start by selecting Map Page from the Layout menu. If you’ve already added location data to any of your images, iPhoto will automatically pinpoint those locations on the map. 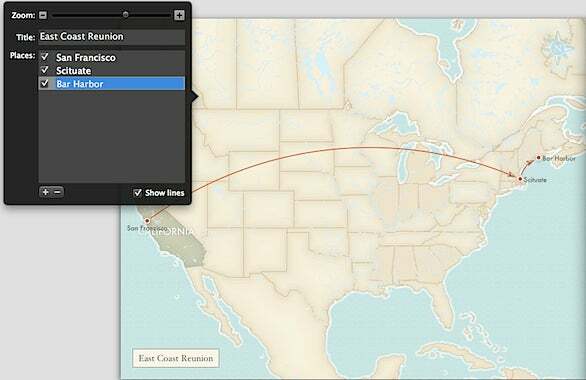 iPhoto's Map page lets you show off your traveling spirit. Use the settings dialog box to specify which cities appear on your map. To fine-tune your map, click once on the page to bring up your mapping options. In the resulting dialog box, you can add new locations, give your map a title, and adjust how much of the map is visible on the page. To pare down the number of mapped coordinates, remove the check mark next to the names of places you don’t want to see. If you turn on the Show Lines option, iPhoto will even draw arrows from one location to the next—a great way to highlight each leg of your journey. The direction of each arrow is determined by the order of each destination in the settings dialog box. Drag your origination city to the top of the list and then place each stopover in order below it. Although the focus of your book will likely be on the images, don’t underestimate the power of the written word to enhance and elaborate on your photos. Almost every page layout in the Layout menu offers an option to include a caption. For more text, select one of the Introduction layouts. iPhoto gives you two ways to adjust fonts. If you click on the Settings button while creating a print project, you can change fonts globally—for example, you can change the font iPhoto uses for all of the dates in a calendar or for all of the headings in a book. But what if you want a particularly important calendar event to appear in a larger font size? Or if you want to mix and match more than one font or style? To perform these font feats, summon the Fonts panel (Edit->Font-> Show Fonts). Select the text you want to change, and then choose the desired font options. By the way, iPhoto doesn’t know the difference between those heinous typewriter quotes (") and true opening and closing quotes (” and “)—also known as smart quotes. If you want professional-looking text in your project, you’ll need to type them yourself. To create opening and closing single quotes, press Option-] and Shift-Option-]. For opening and closing double quotes, press Option-[ and Shift-Option-[. 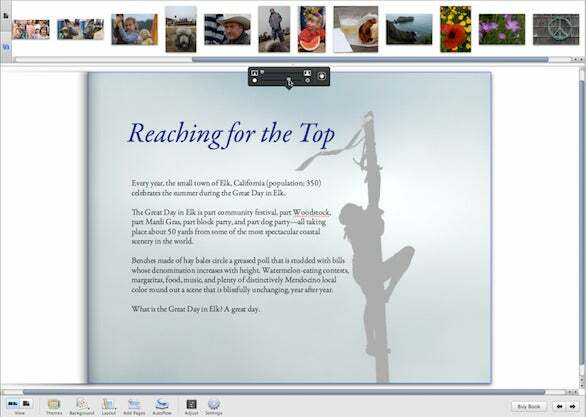 iPhoto lets you use a photo as the background of a book page, with photos and text layered on top. In the book editor, select the page you want to apply a background image to, open the Background pop-up menu, and select the option with a palm tree image. 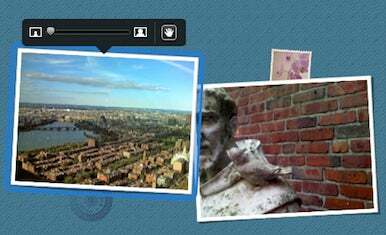 Then, drag a photo onto the book page, being careful to avoid any photo boxes. To make the photo lighter so it doesn’t overwhelm the text on the page, click on the background image once, and then use the opacity slider that appears above the photo. You can dress up a page of text by placing a photo on its background and then using the opacity slider a to lighten the photo. Frustrated that iPhoto makes you commit to just one design theme when creating a book? With a little extra work you can. You plan to use the Line Border theme for a book commemorating a family reunion, but want to start the book with a couple of pages based on the retro-looking Family Album theme. If you use OS X 10.5 or 10.6, you can do this. First, create a new book, and choose the theme you want to use on only a few pages. Create the pages you need, then choose File->Print. In the Print dialog box, choose Save PDF To iPhoto from the PDF pop-up menu, and then click Print. iPhoto creates a PDF of each of the book’s pages, converts them to JPEG images, and adds them to your iPhoto library. Next, create a book based on the primary theme that you want to use (in this example, the Line Border theme). Now drag the pages you made earlier into your new book (look under the Last Import item in the Library pane). To have one of the images fill the page, choose One from the Layout pop-up menu and the topmost option from the submenu. This book combines two different book themes. The one on the right was imported from a another book project. Every Apple calendar, book, or card displays an Apple logo and the text “Made on a Mac” somewhere—it’s on the back of a greeting card, for example, and on the inside back cover of a book. If you’d rather not provide the free advertising, click on the Settings button and then uncheck the box labeled Include Apple Logo.